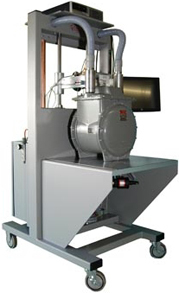 The NoBELL prover is a stand-alone unit designed to test diaphragm meters without the use of a bell or costly vacuum pumps. All calibration and setup data is stored on the provers computer for easy backup and data recovery. Operations are menu driven with a series of graphical screens that guide the operator step by step through the complete test. The software is installed on a PC operating under Microsoft Windows®. A 24-bit A/D converter capable of 1 part in 16777216 resolution, is used in the pressure and temperature circuits. The software can be customized with the customer's data format when communicating test data with the main server computer. This prover also features a Vacuum Leak Test and High Differential Alarm.